Graduate and undergraduate students perform this work created for them by Kota Yamazaki and Mina Nishimura, whose work is strongly rooted in “butoh,” a form of Japanese dance theatre. 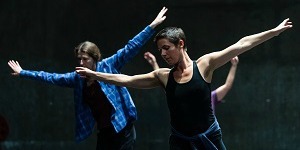 The choreographers are Granada artists in residence this quarter in the Department of Theatre and Dance. Thursday-Saturday, Dec. 6-8 — 7 p.m.
Saturday, Dec. 8 — 2 p.m.